It's Facebook Fridays! for January 8, 2016 and we want to keep you rolling in doe for the new year. That's right, go ahead, dive around in your money like a porpoise! Burrow through it like a gopher! Toss it up and let it hit you on the head! The Lucky Mojo Curio Co. is holding a random drawing to give away 9 money-building spiritual supply prizes. 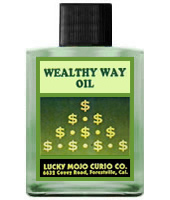 This week the prizes are NINE bottles of hand-made Lucky Mojo brand Wealthy Way Dressing Oil which you can use to dress your lucky dimes. First thing tomorrow morning, we will select NINE winners at random, announce their names here, and ask them to message this Facebook Page with their mailing addresses, so we can send them their FREE Wealthy Way products. We have a winner! In fact, we have 9 lucky winners! Our Facebook Fridays! winners for January 8, 2016 are: Selena Kennon, Sarah House, Sheryl Daniels, Sheila M Wright, Alexandria Michelle, Williams Edward, Jason Harrison, Connie Martell, and Sandra Kitchenka.